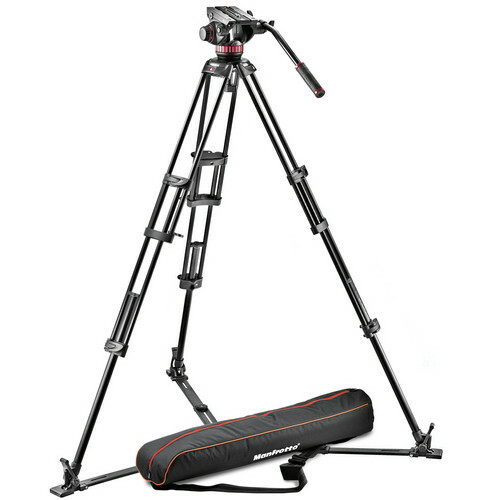 This Manfrotto Bundle includes the 502A Pro Video Head, the 546GB Tripod with a Ground Spreader, and a Tripod Carry Bag. The 502A features a 75mm half ball and 15.5 lb payload, and the 546GB offers a max height of 62". The Manfrotto 502A Pro Video Head with 75mm Half Ball is an affordable yet remarkably fully featured professional head that represents an advance over the popular 501HDV, with sturdier construction and a half ball for precise leveling on a corresponding tripod. The 502A comes in two versions—the "A" ball-base version such as this one, and the "AH" flat-base version which is separately available. Featuring Manfrotto's patented bridging technology (inherited from the 509 and 504 heads), the 502A is designed for executing cinematic moves with compact camcorders and DSLR video cameras. The weight limit is 15.43 lb and counterbalance supports up to 8.8 lb. The balance plate's 3.27" range allows you to correct for uneven payloads that might be due to matte boxes or exotic DSLR rig configurations. The Manfrotto 546GB Pro Video Tripod with Ground-level Spreader is an aluminum two stage/3 section tripod that combines stability and strength with affordability. Reaching a maximum height of 62.4", the 546GB is capable of supporting up to 44 lbs (20kg). Its spiked feet come with rubber overshoes, allowing setups on both smooth floors and uneven surfaces, while a newly designed ground-level telescopic spreader keeps the legs exactly where you need them. Box Dimensions (LxWxH) 15.0 x 8.5 x 8.5"
Box Dimensions (LxWxH) 31.0 x 9.0 x 9.0"
502A Video Head, 546GB Tripod, and Carry Bag Bundle is rated 4.6 out of 5 by 18. Rated 4 out of 5 by Anonymous from Everything you Need I have used several tripods systems and this is a good one. It is very fluid and smooth with panning and tilting. It is easy to level and is very versatile with the availability to remove the spreader. However, using a DSLR or wider body camera blocks the plate lock. Manfrotto does compensate for this by allowing you to be able to turn the locking mechanism without releasing the tension so you can continue to tighten the plate. This is nice but tedious, it would be nice to have the plate lock a little lower to be able to tighten it easier. Rated 5 out of 5 by inner trip from Manfrotto (502HD) and B&H to the Rescue Great tripod, decent price, great fluid head, excellent product and travel case. I cannot be more satisfied with this product. ...... The one thing I would recommend regarding the tripod is to include an extender for the fluid head. I 've been looking for Manfrotto tripods for some time. I'm excited about the possibilities on documentary projects.Great, timely delivery by B&H Photo. Well packaged. Rated 4 out of 5 by Josh S from Great Tripod System I shoot stills and video on both a DSLR and a larger prosumer video camera. I'm quite happy with my decision to get a tripod and fluid head that favor video over still photography. It's much easier to shoot stills on a fluid head than video on a tripod designed for photography. While it does not permit head rotation for portrait-oriented photos, it handles everything else very well. The head moves smoothly for panning and tilting shots and it feels very stable with both of my cameras. I like the floor-level stabilizer, though it feels a little cheaper than the rest of the system. Like others have mentioned, the level is placed awkwardly but I haven't found it to be too inconvenient yet. I would recommend this tripod for those looking for a fluid head tripod who don't want to break the bank. Rated 5 out of 5 by DJ N from Amazing! I am very satisfied with this purchase. Easy and straightforward to use. A tripod is such a vital piece of equipment that every videographer should aim to master. To do that you need a decent tripod. This one exceeded my expectations and is a very nice combo package of legs and head. It is fluid and stable, with user friendly adjustments. Great piece. Rated 5 out of 5 by VideoMan from Exactly what I wanted! I am a freelance videographer and do a lot of filming that requires mobility and stability. This tripod offers both the durability and functionality that I was looking for. It's sleek, lightweight and the fluid head works really well. It's not the top of the line for tripods, but it completely fills my needs. Rated 5 out of 5 by donegalvolvo from excellent sturdy tripod Using with a son ned ea50 and handles it perfecty. Comes with spreader which needs to be removed for a dolly. Feet without spreader or dolly have sharp edges so you would always need these. head has nice fluid motion. Rated 4 out of 5 by TechmanZach from Great Head Not so Stable Tripod The 502HD fluid head is AMAZING! The 546GB Tripod is not very stable unless you put sandbags in the middle of the base.